You’ll love this Chunky Chicken Salad Lettuce Wraps recipe. This lightly dressed chicken salad is so delicious and satisfying. Although this recipe calls for pre-cooked rotisserie chicken, feel free to use your favorite grilled chicken recipe instead. If you have the room and use rotisserie chicken on a regular basis, a home rotisserie oven is both affordable and useful. The aroma of roasting chicken alone is worth it, but it’s also versatile and has many uses. 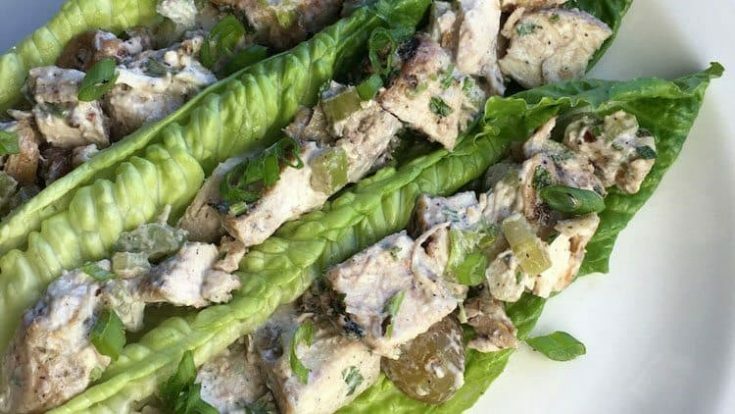 Similar to our Chicken Salad Sandwich recipe, the chicken salad in this recipe uses grapes. We LOVE grapes in chicken salad. If you want, you can add a little bit of chopped celery for some added crunch. Looking for more healthy low-fat recipes to try? We’re pretty sure you’ll love these Weight Watchers recipes: Weight Watchers Taco Soup, Weight Watchers Chili and Weight Watchers Deli Crab Salad. Delicious recipes that are friendly on your diet and taste great too. This is a low-fat recipe that is perfect for anyone, but is especially helpful for those wanting to cut calories. Want to reduce your calories even more? Make a regular salad and add a scoop of chicken salad onto the vegetables…you’ll get a couple servings of vegetables in, enjoy some excellent tasting protein, and have a wonderful meal. For a more gorgeous presentation, use a metal serving scoop. It’s great for portion control and making a scoop shaped serving. Looking for more great recipes that are low-fat? Here are some cookbooks that have an amazing selection of healthy recipes: Salad of the Day, Paleo Wraps – Delicious and Gluten Free, Low Fat Recipes. TIP: Boston Bibb lettuce is another excellent lettuce variety for this recipe because it has attractive, naturally bowl-shaped leaves. In a small glass bowl, combine mayonnaise, Greek yogurt, Dijon mustard, red wine vinegar, garlic powder, and oregano. Stir to combine thoroughly. Season with salt and pepper, to taste. Set aside. In a larger non-reactive bowl, combine chicken breast, celery, pecans, grapes, parsley, and green onion. Add dressing and gently stir to combine all ingredients thoroughly. Season with additional salt and pepper, if desired. Cover and place in refrigerator for at least 30 minutes to overnight to allow the flavors to combine. To serve, divide the chicken salad between the Romaine lettuce leaves. Garnish with parsley and/or green onions, if desired, and serve immediately.